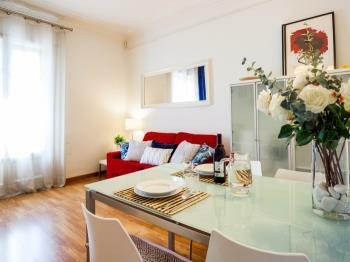 The Gran Via A Barcelona apartment (HUTB-003613) is located on the second floor of a building with an elevator. The apartment has been refurbished, preserving elements that give the stately air of the art nouveau quarter of the Eixample in Barcelona. This apartment comes with a double bedroom with a queen size bed, a bathroom and an open plan kitchen fully equipped for a self-catering holiday. 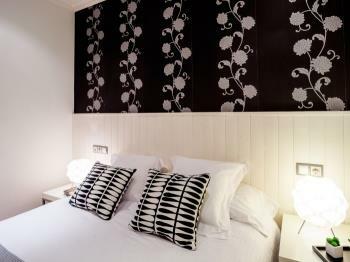 The living room is light and spacious with a balcony faced to the Gran Via Street and there is a comfortable double sofa-bed. 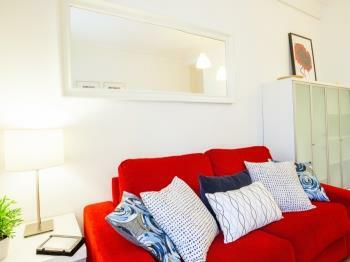 The apartment provides accommodation up to four people. We need to plan your check-in: Please inform us about your arrival time to Barcelona and flight number if you are coming by plane. Check-in after 21:00 is subject to a surcharge of EUR 30. 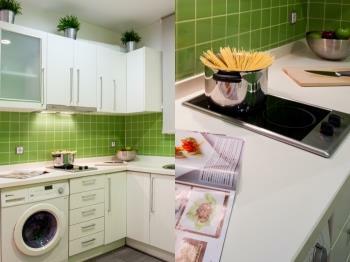 Double bedroom apartment (HUTB-003613) fully equipped, open kitchen and living room with sofa bed. In the apartment you will have a sense of spaciousness given by the high walls typical of the classical constructions of this area. 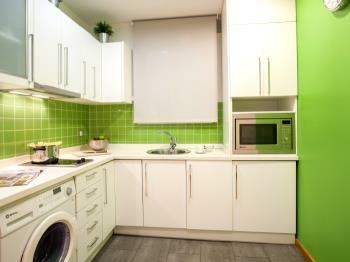 The installations are new since the apartment has been recently renovated. The living room is bright and has a small balcony overlooking the outside. You will share the access spaces to the building with the other residents. 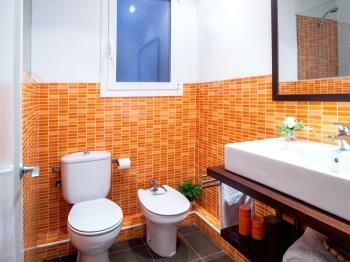 The apartment and its facilities are for you private use. 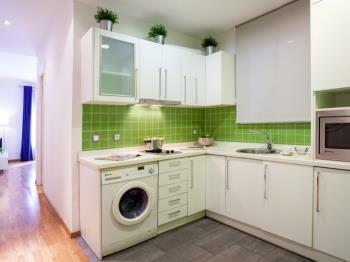 While you will enjoy the apartment and its amenities, we will be available if you may need us. We work as a team to give you the best service and to be reachable 24 hours a day. Tell us if you need us to help you organize some aspect of your stay as entertainment reservations or a parking space, or if you need more instructions to prepare your arrival. It is a neighborhood located in the center of Barcelona very well connected with all the main areas. In the urban landscape of this area reigns the modernist architecture which in the last century was associated to the high social status of the buildings residents. The sculptural richness of details in these constructions will entertain you pleasantly if you decide to take a walk from the apartment to Passeig de Gràcia. You will have nearby the impressive commercial center of "Las Arenas", constructed in an old bull ring, the Miró park and the magic fountains of Montjuïc. The key location of this apartment will allow you to walk to many points of the city such as Motjuïc (8 minutes) or Passeig de Gràcia (15 minutes). 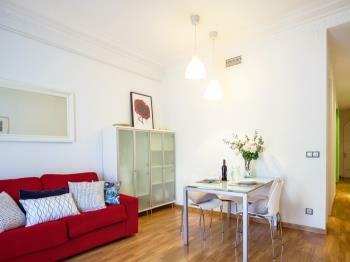 The nearest metro station is Rocafort (L1 - red) and is located 100m away to the apartment. 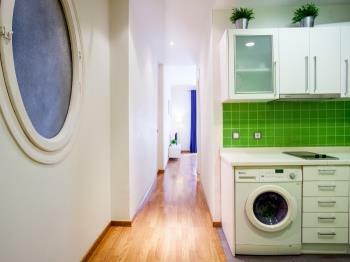 This beautiful apartment (HUTB-003613) is located on the second floor with elevator of a typical building of l'Eixample. It has been recently renovated, maintaining the spirit of Barcelona's classic constructions and adding the elements of modernity and design to create a perfect combination that will allow you to enjoy your stay with absolute comfort. 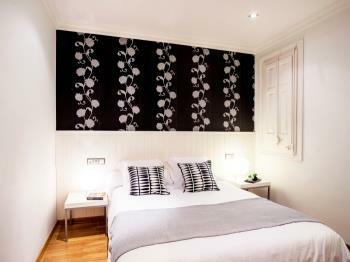 The apartment has a double room equipped with a double bed, bathroom with shower and fully equipped open kitchen. 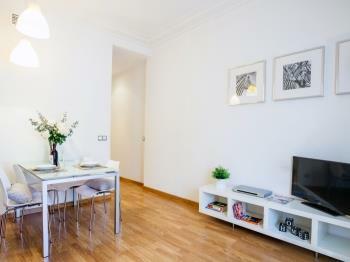 The living room is a bright space with a small balcony outside Gran Vía. 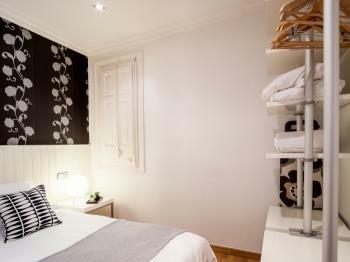 The apartment can accommodate up to four people, distributed between the double bed in the room and a double sofa bed located in the living-dining room.